After An Early Breakfast Drive For, Hanuman Chatti. On Arrival Start The Day On A Tough Trek Of 7 Kms One Side. Arrive At Yamunotri And Offer Prayer At Temple Also Take A Holy Achman To Start Your Most Sacred Pilgrimage To Char Dhams. Later Return To Phool Chatti In The Evening To Return To Hotel For Dinner And Relaxation. Overnight At Hotel. After Breakfast Drive To Gangotri And On Arrival Take A Holy Dip In The Sacred River The Ganges, Also Called Bhagirathi At Its Origin, Also Perform Pooja. Back To Resort In The Afternoon To Relax In The Bright Sunshine And Some Of Breathtaking Views Of The Valley Beautiful. Dinner And Overnight At Camp. After Early Breakfast Leave For Guptakashi. Enjoy Lunch At Srinagar. On The Way See The Heritage City Of Tehri. 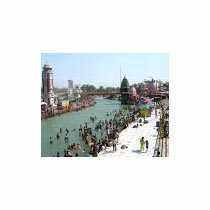 After Lunch Restart Your Journey And See The Beautiful River Mandakini. Continue Drive To Guptakashi. On Arrival Check In The Char Dham Camp (Guptakashi) Located 2 Kms Out Of Town Towards Gaurikund. Dinner And Overnight At The Camp. (Drive 32 Kms Trek 14 Kms) After Breakfast Pick Up Your Packed Lunch And Leave For Gaurikund (A 32 Kms Drive One Way). On Arrival Start Your Journey On The Tough Trek Ahead. Stop For The Lunch And Restart To Arrive By Late Afternoon To Kedarnath. On Arrival Check In Ashram. After Freshening Up Perform Pooja And Darshan At The Shri Kedarnath Ji. In The Evening Visit, Adi Shankaracharya Samadhi At The Back Of The Temple. Dinner And Overnight At Ashram. (Trek 14 Kms, Drive 32 Kms) After Breakfast Start Your Journey Back To Gaurikund And On Arrival Leave For Guptakashi By Road To Reach The Char Dham Camp By Evening. Relax With Ayurvedic Massage. Dinner And Overnight At Camp. After Breakfast Leave For Jyotirmath Via Chopta, One Of The Most Beautiful Sites On The Whole Trip. Enjoy The Beautiful Drive Through The Thick Medicinal Forest And Stop At Pipalkoti For Lunch. Arrive At Jyotirmath By Late Afternoon. Evening Free In Jyotirmath. Dinner And Overnight At Resort.